Enjoy contemporary style with room to relax with this sofa chaise. The chaise can be configured on either side of the sofa chaise to best fit your space. It features sweeping flared arms and the clean lines of box seat cushions. 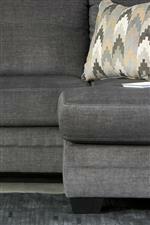 The Charcoal gray upholstery fabric complements the two sets of accent pillows, one with a light gray fabric and the other with a neutral toned geometric print. The Braxlin Contemporary Sofa Chaise in Gray Fabric by Benchcraft at Michael's Furniture Warehouse in the San Fernando & Los Angeles area. Product availability may vary. Contact us for the most current availability on this product. Seat Loose Box Seat Cushions. Refined contemporary style with lots of flexibility to create your perfect living room setting, pick your choice of items from this collection to update your home. The sofa chaise offers a cozy chaise that can be configured for use of either side of the sofa chaise. The Braxlin collection is a great option if you are looking for Contemporary furniture in the San Fernando & Los Angeles area.